Jute of Bangladesh has made a strong comeback in the international market thanks to diversification of products made of the golden fibre. “W’re now producing 235 types of diversified jute products. The country is earning at least Tk 700 crore a year from exports of diversified jute items,” Mainul Hoque, director (PMI) of Jute Diversification Promotion Centre (JDPC), told the daily sun. He said the number of diversified jute products will reach 250 by December this year to add to the export basket. “JDPC is working to promote diversified jute products both in the local and international markets. Our aim is to become one of the market leaders in the international market,” said Rina Parveen, executive director of the JDPC. Recalling the golden age of the jute sector, experts said there was a time when the jute industry was the country’s largest foreign currency earner. But the glory faded away due to lack of proper government policy, widespread popularity of synthetic substitutes, lack of innovation and diversified items, and subsequent fall in demand for jute. “Though our neighbouring India has made huge advancement in jute sector within a short period of time, Bangladesh couldn’t do well in this sector due to lack of proper policy in favour of the jute industry,” said Rashedul Karim Munna, convener of the Diversified Jute Products Manufacturers and Exporters Association. He also said this is a high time to bring back the lost glory of the jute sector as there is a huge demand for diversified jute products across the world amid the growing concern over environmental hazards and pollution caused by synthetic products. The demand for natural and bio-degradable products, including natural yarn is also increasing in the global market, he added. 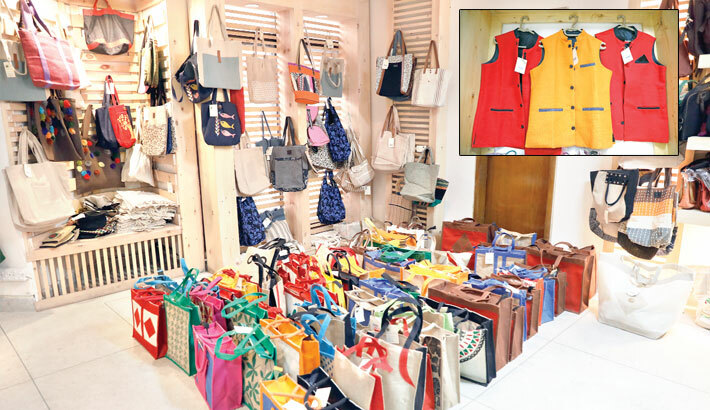 Mainul Hoque said a total of 636 small and medium entrepreneurs are now producing 235 types of the diversified jute products. These products include different types of bags, shoes, gardening products and a wide range of household and everyday items such as cushion and pillow, basket, floor cover, table stationeries, ornaments, show-pieces, share, ladies and gents dress and table mat. Bangladeshi jute products are now being export to at least 40 countries including the US, UK, Australia, Canada, Japan, China, Singapore and different European countries, he added. The JDPC director also said they will soon launch an online shop for selling diversified jute products to customers from home and abroad. Established in 2002, the Jute Diversification Promotion Center has been working to accelerate the diversifications of jute products in greater scale and make the industry more attractive and acceptable to the private sector entrepreneurs. Mainul Hoque said the JPDC provides pre-investment counseling, in-plant advisory services, technical information, innovative technology, design and product development services, raw materials from Raw Material Banks and assists in the financing of enterprises through commercial banks. It also facilitates marketing of jute products through fair, exhibition and other mechanism and platforms. He said they also organise skill upgradation training programmes for entrepreneurs, designers, artisans and workers, entrepreneurship training programmes for new and existing entrepreneurs. JPDC also hosts regular workshop, seminar and idea sharing events to promote jute products. State Minister for Textiles and Jute Mirza Azam at a seminar recently said the jute sector will no longer be dependent on raw jute exports as diversified products are being manufactured in the country while more production units are in the pipeline. “More investors are choosing the jute sector due to product diversification in the jute sector,” he said. Faizur Rahman Chowdhury, secretary of the Ministry of Textiles and Jute, recently told the daily sun that the jute sector has the potential to make greater contributions to the country’s economy. “We are working to revive the jute sector and we have already made huge progress compared to the time when jute cultivation and its business almost ceased to exist,” he said. He said diversified jute products are being produced in the country to meet the demands of the local and international market. According to the Department of Jute, the jute industry still remains the single-largest industrial sector in Bangladesh. Raw jute, traditional jute goods (hesian, secking, cbc, yarn, carpet) and multi-purpose jute goods account for 3.86 percent of the country’s total export earnings. Bangladesh produced 4.84 lakh tonnes of jute goods and earned Tk 2,557 crore by exporting 3.81 lakh tonnes of jute goods until January this year, according to data collected from the Department of Jute. The government enacted the Mandatory Jute Packaging Act 2010 providing for compulsory use of jute in the packaging of several products to discourage use polythene bags.